This entry is a month old. Seriously, one month tomorrow 🙂 Fortunately, it was so much fun that I do not have a problem remembering everything that happened. 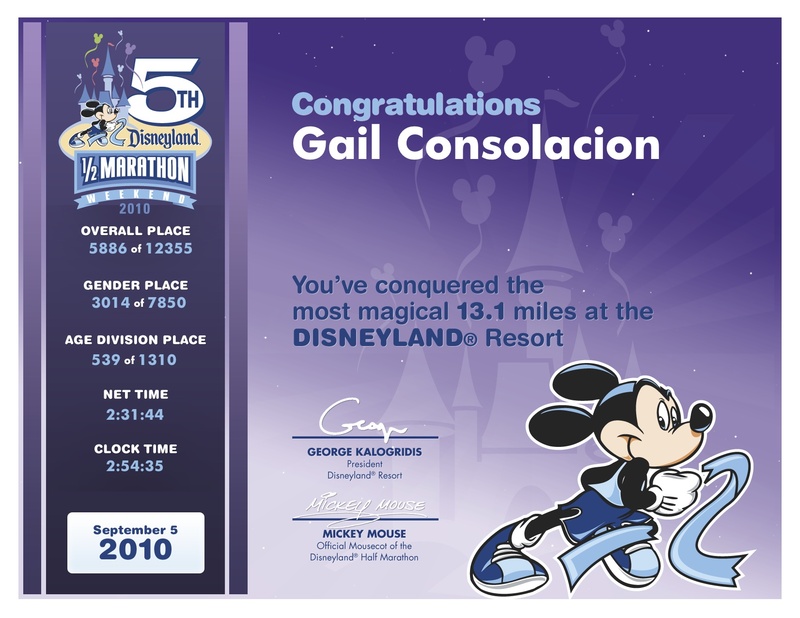 I have planned to join the Disneyland Half Marathon as early as March. 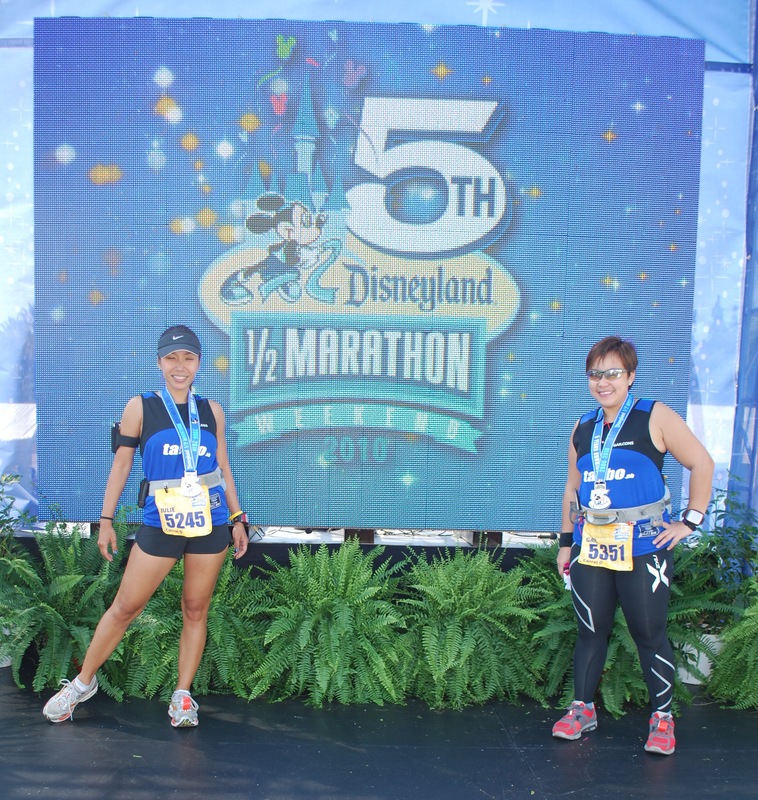 The Disneyland Half Marathon weekend happened on September 4-5 (Sat and Sun). Saturday would hold the kiddie fun run and the Health & Fitness Expo where runners would collect their race kits; check out & shop for new gears and listen to different speakers, which included, one of my idols, Jeff Galloway. Registration was no-frills as it was made through an online site. Expected time to finish and proof of time were requested for proper corral placement. I realized to my dismay that my arrival in the US via Las Vegas would be on the evening of Sept 2. It means that by the time I get to LA on the 4th, I would still be jet-lagged. It takes me at least five days to adjust whenever I take trips to Europe or the US. I thought to myself, too late to panic now. I just hoped for the best. Runners were required to attend the expo to pick up their race kits so as soon as I arrived in Orange County, my BFF Charlotte and I dumped by stuff in her apartment, grabbed a quick lunch and headed to Disneyland. The expo was held at the Disneyland Hotel near Downtown Disney. After our Jeff G. encounter, we proceeded to collect our race kits. As expected, the queues weren’t long and the claim process was fast and efficient. The only documents that they required to see were the signed waiver, which stated which corral would you be placed in, and a copy of your ID. 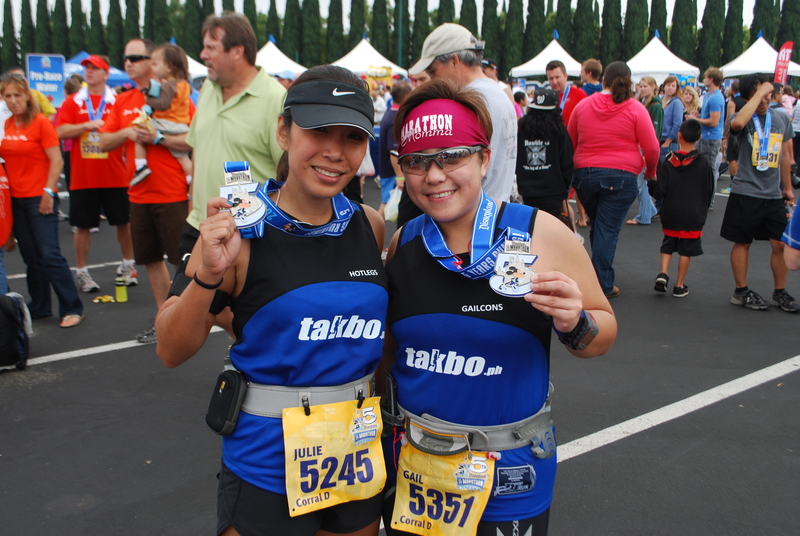 The kit contained the race bib, coupons, Disneyland HM handbook and the D-Tag, which will serve as the timing device. We were made to scan the D-Tag and check if the details programmed in it were correct. I was pleasantly surprised to notice that even if the event had twelve thousand over runners, the queues were minimal and the venue was not cramped. The gang and I went back to the main expo to get our tech shirts and to check out the gears being sold. A note to all: when joining a race in the US, expect their sizes to be larger than expected. My medium shirt looked like it was large or XL. Since our Takbo.ph family was not there to create banners for us ( we miss you Mommy Marga! ), Julie and I created our own banners. The race organizers provided the materials. Cool huh?! After taking some more photos, we hurried out of the expo. Charlotte and I didn’t want to pay for parking after 5pm :p As soon as we got home, we dressed up and left for dinner and a night out with some LA-based friends. We had Japanese fusion sushi rolls (lots of it) for dinner and some (more of a lot) of Yogurt from Yogurtland. Nice. Now I am jet-lagged, I lack sleep, I am unused to the cool weather & so stuffed from dinner. Wonder what happened to me on race day? Take a quick guess. I had less than 2 hours of sleep. Even with the help of Benedryl, I snoozed soundly for only an hour, tossed and turned the next hour. Deciding that it was useless, I got up at 2am to take a shower, feel and adapt to the cold weather and get some breakfast. Charlotte took me to Mike and Julie’s place at 4am. We were on our way to the event at 430am. Unfortunately, some roads were already closed when we got to Anaheim so Mike had to drop Julie and I a few blocks from the starting line. A few blocks turned out to be a long walk, maybe 2km worth. By the time we arrived at our corral, we were all warmed up and raring to go. Starting times were based by corral (every 5mins). Since we were placed in Corral D, we will take off 15 minutes from gun time. 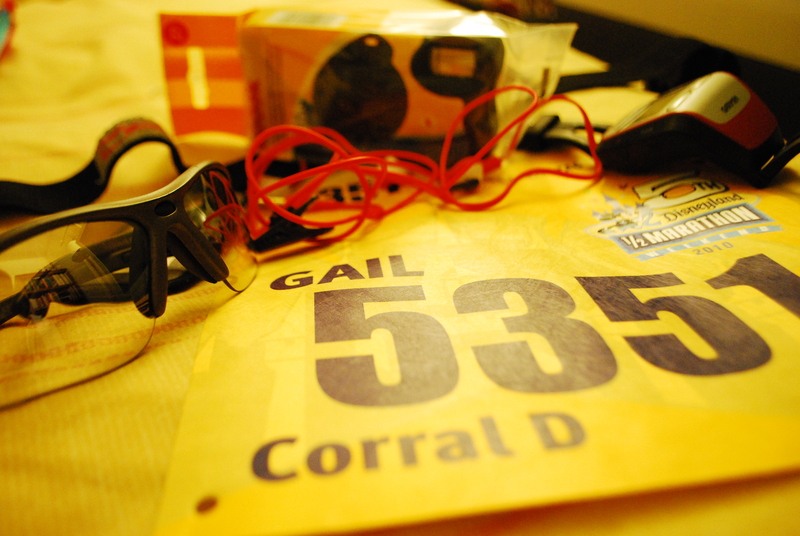 When our corral was called, we thought that we would already start so we downed our energy gels to get ready to run. Gel’s kicking in, we were still far from the starting line. Talk about anti-climactic! Finally, it was our turn. The difficult part when running a well-attended race is weaving through the crowd of runners. It was an added effort to avoid crashing into people who suddenly stop in the middle of the street. This happened to me more than once and at one time, I felt my left knee almost giving way due to my suddenly lateral movement. But once we were running alongside people who were running at the same pace, we were good. The route took us inside Disney California Adventure where we saw famous Disney characters like Cruela De Vil & Maleficent. Julie was dead set in breaking her PR which would be her sign to join the Las Vegas Rock ‘n Roll Marathon that she didn’t want to stop and take pictures. I, on the other hand, just wanted to finish the race in decent time and if permitted break a sub-2:30. I knew that I didn’t train enough for this but if I can just push myself harder, I knew I would do a sub-2:30, right? I felt good at the first 7 miles/11.2k. Based on our splits, we finished the initial 10k at 1:06. Not bad. Even better than my Takbo.ph runfest time. The cheering crowds, the different bands and performers kept our energy going which in turn kept us running. Unfortunately, after the 8th mile, I began to feel uneasy. I was sweating and had chills at the same time. The weather was a windy, cool 17 degrees Celsius. But for me, it felt COLD. My chest felt like it was going to explode that I had to stop and rest. I bid Julie goodbye, told her to go ahead and fell back. I felt dizzy and disoriented. I decided to walk, rest and enjoy the sights. 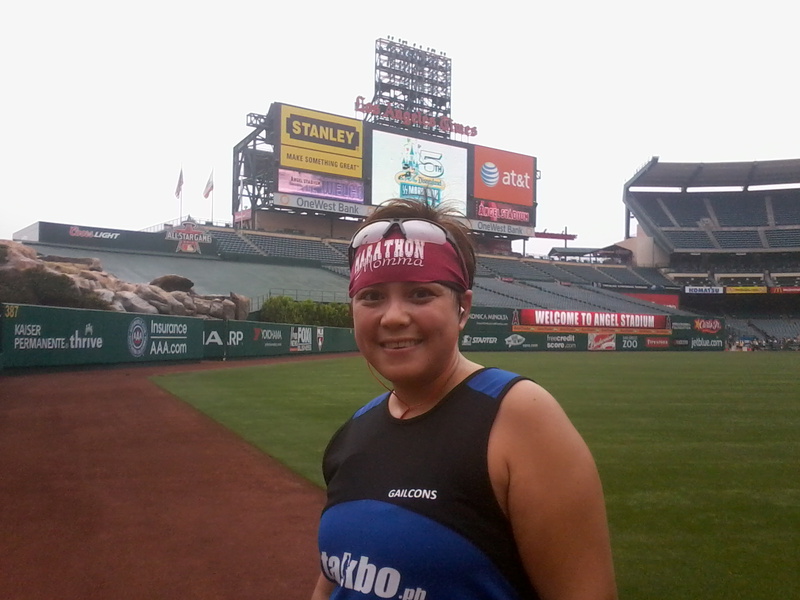 But my rest still didn’t do me good; by the time I reached the entrance of the Angel Stadium, I started to vomit. I vomited mostly water. It dawned on me that I might have drunk too much water having been used to the practice of drinking at each water station available. It sure did help me back home where the climate of course is tropical. Lesson learned. 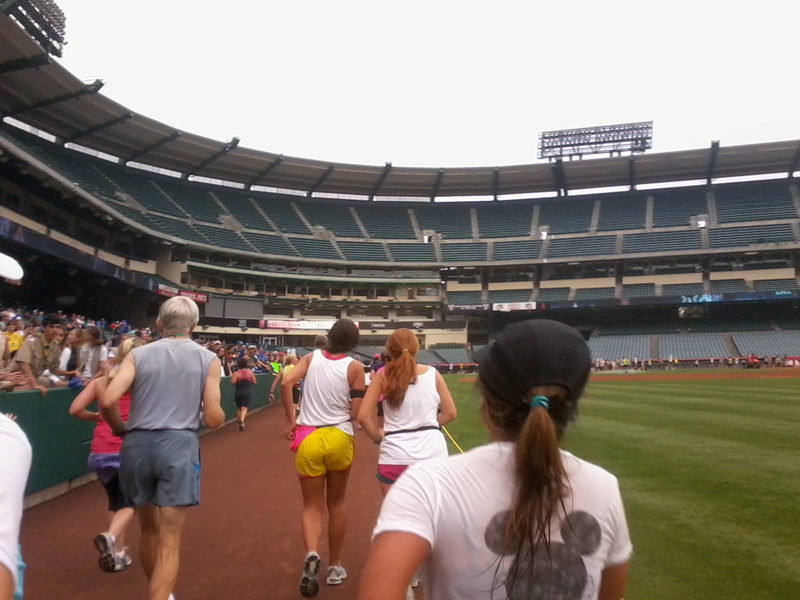 As soon as we entered Angel Stadium, I felt so much better. Knowing that the finish line is only 6k away was a relief. The Angel Stadium was enormous! They placed a huge LED screen, which showed videos of the runners who passed by. Unfortunately, I didn’t catch myself on the big screen. I did get someone to take my photo. Yahoo! The last 6k was uneventful. I ran at LSD pace, not wanting to induce any untoward feelings. I already felt guilty exposing my body to tremendous stress while thousands of miles away from home. At the final stretch, I picked up my pace a bit and finish with a Clock Time of 2:54. I was expecting a chip time of 2:39 following the 15mins time difference between Corral A gun time and D gun time. I was pleasantly surprised to find out that my chip time was 2:31, only a minute shy from my 2:30 PR. The after-race activities were, as expected, organized. As soon as I passed the finish line chute, a volunteer handed me a sealed cooling towel, two powerade drinks and a bottled water. There was a short queue before you reach a photo wall where they will take a post race photo of you. After the photo wall was a huge refreshment tent. Inside the tent were tons of bagels, bananas, Clif energy bars, oranges…TONS of it! I didn’t even have enough hands to carry my drinks so I just grabbed a pack of energy bar and left to look for Julie. Happy finishers! Love, love the huge (and heavy) Medal! Every race is a learning experience and this is no exception. I learned that when you plan to race in an unfamiliar place with a different climate and time zone, it would be a good idea to do a test run to allow your body to adapt to the environment. Having enough sleep is a must. Allow at least 3-4 days for your body to adjust to a new time zone before race day. Do not go on a binge night before a race. Lastly, listen to your body. 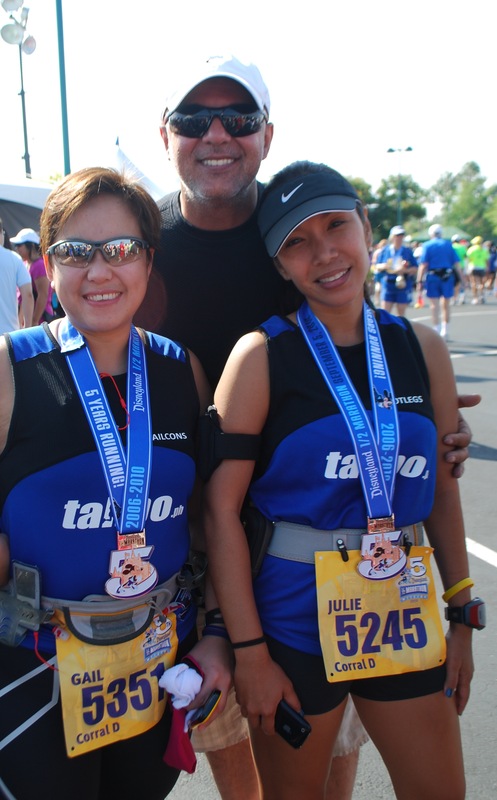 I want to thank my running buddy Julie & her fiance (our lone cheerer) Mike for sharing this experience with me. Next race: NYC Marathon? Special thanks to my good friend Charlotte who picked me up from the airport & drove me to the expo, her hubby Rex who took care of my missing baggage (it went missing for 5 hours…stress! ); to my cousin Marie who picked me up after the race; the Recinto family who waited for me by the finish line (even if I wasn’t able to see them, I was touched to know that they were there to cheer me on), my Team CB & Takbo.ph families for the prayers and cheers; Thank you to my hubby, Noy & to our kids, who were in my thoughts while experiencing this magical event (i dedicate this race to you) and to God for looking after me and letting me finish the race in one peace. 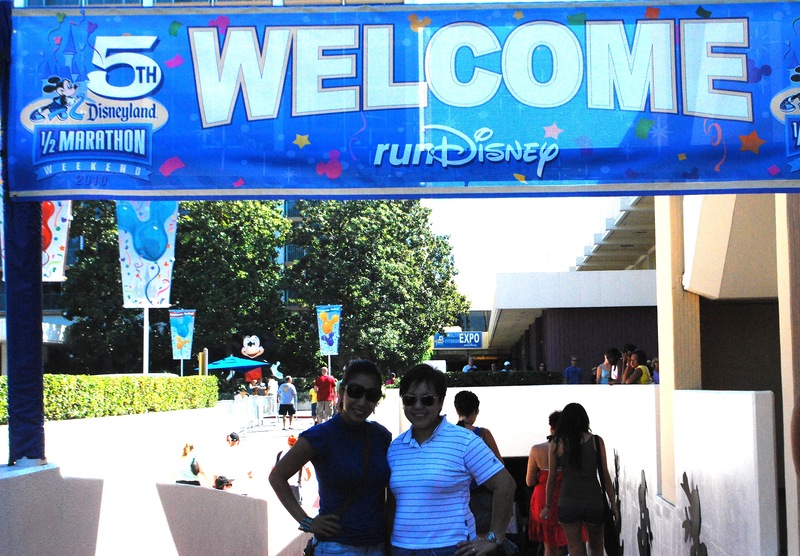 I ran in the happiest place on earth and I had an unforgettable experience. Disneyland is a magical place where it is free to dream, hope and live. I dreamed, hoped and lived. great review gailey!!! had so much fun with you! a very late post race review! :p I joined it na. miss you! mwah! « Ready for the Men’s Health Urbanathlon 2010?